The only difference is they are all born with Down syndrome, and as the cast of the new six-episode series that premiers tonight on A&E shows viewers, there really is no difference at all. And that was the whole idea behind making “Born this Way,” the latest reality show from producers Bunim-Murray, the company that created the Real World, Project Runway, and Keeping Up With the Kardashians. Murray said his production team had been researching the idea for years. They found a group of young people from the Orange County area who had already been friends through organizations and churches. His team also consulted with administrators from New Horizons, the North Hills based social service agency that has worked with people with developmental disabilities and their families for more than 60 years. “Born this Way,” may owe its concept to the Real World, a reality show that began in 1992 where seven strangers who were picked to live in a house and had their lives taped, exposed viewers to young adults dealing with their own sexuality, HIV, careers and relationships. And it was the right time for “Born This Way,” he said. The show may have a deeper appeal to millennials, a generation Murray said is more open and willing to embrace diversity, moreso than any other generation. Cynthia Sewell, chief executive officer of New Horizons, said she admired the way the series gave the developmentally disabled community and their parents dignity. She also said the series comes at a time when those who work in the field in California have been calling for a boost in funding for various programs, to help people with developmental disabilities to live independently. California’s Lanterman Developmental Disabilities Services Act mandates that people with developmental disabilities and their families have a right to receive the services and support they need to live like those without disabilities. But many have said those rates paid out to fund those programs have been frozen for two decades. Then, during the Great Recession, more than $1 billion in funds were cut from the Department of Developmental Services, which serves 280,000 Californians. That funding has not come back, advocates have said. Rallies are planned Thursday statewide to once again garner support from legislators. 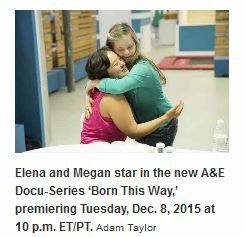 “Born This Way,” will premier 10 p.m. Tuesday on A&E.